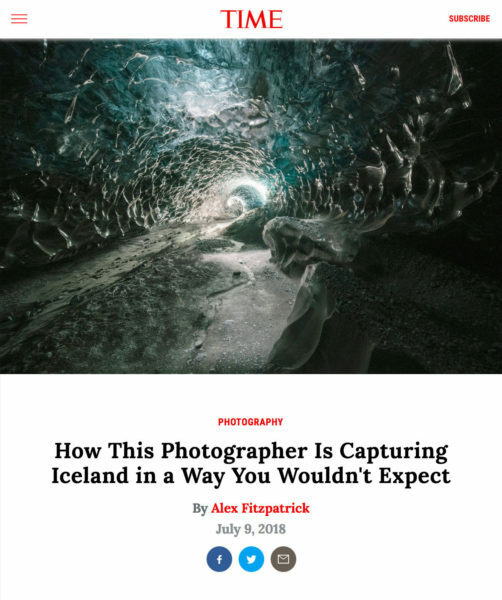 My recent series on Iceland has been featured on TIME.com. Îslandia is a series that looks at Iceland from a distinctly fine art perspective and tries to get away from the grand touristed vistas. More than 1 trillion photographs are made every year, according to some estimates, an unthinkable figure that compounds a longtime problem for photographers: How do you make your work stand out in such a crowded field? I think this is a very good question, and also asks an even more important question– how do you make work that is deeper, that is a unique personal response to subjects that have been photographed an infinite number of times? I spoke to TIME’s deputy editor Alex Fitzpatrick and multimedia editor Josh Raab about my approach. Find out my response to this question at TIME.com. These pics are amazing Kiliii and how awesome to be in TIME. Makes me desperate to get back to Iceland again soon!